Let’s play a game. On board? Pretend PubCon never ended (man up, liver!). You’re still in Vegas. You’re having fun. You’re dancing. You’re partaking in some adult beverages. It’s 5 in the morning when you finally decide to stumble back to your hotel room to pass out. Groggy, with a headache, you wake up the next morning feeling content and still gigging in your head about all the fun you had last night. Until you turn over. AND THERE’S A STRANGER IN YOUR BED! Someone you’ve NEVER SEEN before. What the hell happened last night? CONTROL Z! Crap! It’s jarring. To suddenly see someone you don’t know in your sacred space. That’s how I feel about the new Retweet Feature on Twitter. Not because I’m having a “Facebook moment” where change freaks me out, but because they just ruined and violated some of the core ways people use Twitter. The ones users had created themselves. Here are a few of my issues with the new retweet feature. Ask yourself: has Twitter forgotten where it came from? Now when someone in my network retweets something, I don’t get their avatar. I get the avatar of the person being retweeted. Ev assures me that I’ll “get used to this”, that it will “be a welcomed change”, and that there were lots of good reasons for it, but unfortunately for him, I disagree. And I’m not alone. According to one poll, only 6 percent of respondents like the change as is. Showing the unfamiliar avatar does not give me “more context” for the tweet. It gives me less because I don’t know this individual. If I were to see Rae’s avatar, I’d know to trust the content. I’d know it already passed the snuff test. When I see someone else’s avatar, I’m thrown off and confused. Will I get used to it? No, I’ll simply learn to ignore things from people I don’t know. They’re now ads that I’ll tune out. Celebs like Justine Bateman found the change so jarring that she accused these strangers of being “shitheads” spamming her. There goes any value I once had from retweets. Or my ability to think about Mallory Keaton without giggling. The point is, using someone else’s avatar loses that trust factor. In social media, it’s always about trust. Realize that it’s the little and the silly things that your users love about you. Being about to add “that’s cool” or “zomg awesome!” may sound like a really trivial thing if you’re an CEO looking down…but your users live for it. That’s why they retweet stuff – to share the link but to also add their own sauce and flavor. It’s what Twitter is based on – the conversation between users. The new retweet feature doesn’t allow me to add my own comments. I’m stuck simply parroting back what was already said. 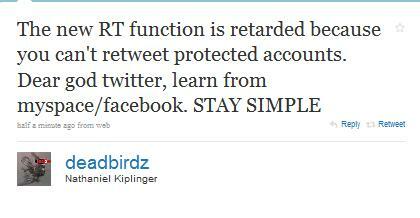 Redefine the definition of what retweeting is and you limit the amount of content being passed around. The new features also assumes that RT’ing something always means that you agree with it. That it’s a Google-esque “vote” for that content. That’s not the case. Sometimes I’m retweeting things because I think the content is moronic and I want to add my own commentary and point it out. I don’t get that right anymore. It does me no good to find good content and retweet it if I’m not getting credit for it. Sorry. Let’s not pretend that a good deal of retweeting is not motivated by ego. THIS IS THE INTERNET! That’s why people share content to begin with. To show everyone else how smart and savvy and clever we are. Twitter just took away my finder’s fee. How do you create a feature that a large segment of your users can’t even use? Now when you retweet something, you’re ‘liking it’ the way you do on Facebook. You’re not creating something new and of value, you’re simply attaching your meta data to something that already exists. It’s no longer a separate tweet. Andrew Mueller thinks this was done to bring value to Bing and Google. I agree with him. He doesn’t like the ‘we know best’ tone Ev takes in his post to explain the decision. I agree with him. They took about the flexibility of retweeting without giving users anything of value to make up for it. Obviously this wasn’t done for us. It was done for whatever master plans Twitter has. That’s fine. Until you disrupt my life with no benefit. If I’m going to be jerked around and made to jump through hoops, there at least better be something of interest on the other side. Otherwise I’m just going to beat you with the hoop. There’s a point in every company’s time line where they stop listening to users and start thinking they know best. This is usually the point where early adopters die off and when sites become more complicated instead of smartly scaling themselves down. People don’t want fancy functionality. They want the box. They want to be able to retweet by hand and add their own thoughts. According to Ev, old retweeting is still “allowed” (wow. thanks, Ev!). However, I still have followers who will try out the new way and insert possible muggers, thieves and puppy killers into my stream. Twitter has now left me in a really uncomfortable position – let the strangers in and give up the sanctity of my network or block retweets from people in my network. I don’t like how that feels. I don’t like any of this. If There Could Only Be One: Twitter or Facebook?